This is the shortened form of a longer article published by Dr. David Salinas Flores, MD, Professor of Medicine at the Universidad Nacional Mayor de San Marcos, Peru in the International Physical Medicine Rehabilitation Journal, J. 2018; 3 (5):381‒392 and sent to this media site for re-publication. Please consult the longer form of this article there now for all references, which will be provided accurately here shortly as well. Copy-edits and sub-headings have been added for clarity and ease of reading in article format, and are not in the original version. This article is being published with permission of the author, and much gratitude to him for describing these critical matters of ongoing and impending transhumanizing-by-billionaires and permanently digitally and genetically enslaving the rest of humanity–unless stopped by all of us, acting with conscience and urgency–-with such insight and clarity. Dr. Flores has published many articles on related subjects, and hopefully more of them will be republished here soon. 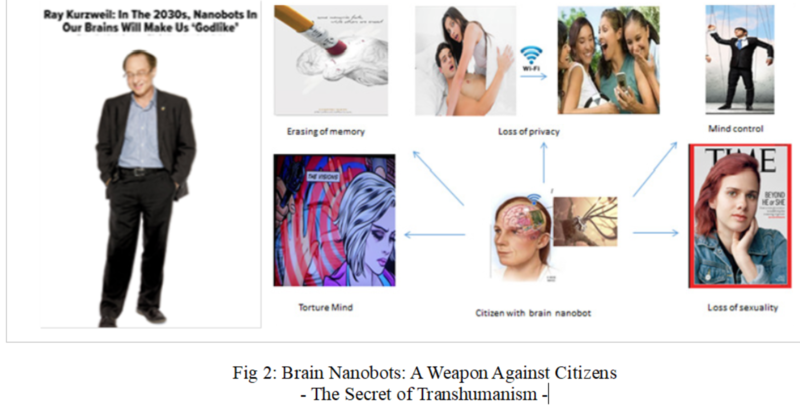 This one, The Human Connectome Project: American Fraud which discusses brain nanobots in creation of the “connectome” and this one, The nanomafia: nanotechnology’s global network of organized crime, are closely related to this article. Transhumanism is promoted according to the World Transhumanism Association as a philosophy that advocates for the use of technology in order to be able to overcome our biological limitations and to transform the human condition. Transhumanism is an international movement that states that adding technological implants and inserting DNA will improve the human being. This movement is promoted as a benefit to society, as part of the natural evolution of the human being, or an extension of humanization1, and even as a “revolution”. Transhumanists state that adding technological implants and inserting DNA in human beings will improve their condition; man would leave biological evolution and begin an evolution based on technology; the post-human species would be born. The essence of Transhumanism is applying the so-called four emerging technologies that include Nanotechnology (N), Biotechnology (B), Information Technologies (I), and Cognitive Sciences (C) in the human being (NBIC). Transhumanists do not only seek to improve health, to eliminate disabilities or to cure diseases but also to produce stronger, faster, more athletic and more intelligent human beings with technology. For Transhumanists the time has come for human beings to take control of their own evolution, this evolution based on technology will open the doors to create a new species descending from Homo Sapiens. Human beings will be replaced progressively by “trans-humans” (H +) or “post-humans” ( H + +) who will live 500 years. In 1999, President Bill Clinton at a ceremony in the White House gave him the National Medal of Technology, the United States’ highest honor in technology; (other Transhumanists like) Nick Bostrom has been awarded the Professorial Distinction Award of the University of Oxford, Donna Haraway has been awarded by Yale University with the Wilbur Cross Medal — the school’s highest honor — for an alumnus of this university, and Aubrey de Grey is a Moscow Institute of Physics and Technology Professor. Transhumanists’ affirmations are public and are made with conviction and confidence; that surprising confidence is the most mysterious aspect of their statements since they even lead in expressing dates close to the launching of their implants in human beings massively. Transhumanism uses a series of advertising cliches, these being the main ones: “innovation,” “evolution,” “excellence,” and “digital citizen,” and different advertising campaigns in which the most promoted intellectuals and businessmen like Elon Musk, Larry Page, and Nobel Prize winners like Mario Vargas Llosa, who promote human robotisation participate. In spite of the millionaire promotion and support of mass media to Transhumanists and in spite of statedly considering as “philosophy” the science of love of wisdom, they hide the truth, the most important information: The harmful effects of the technological implants in the human being and the method their almost delirious Transhumanists objectives are being developed with. Technological implants like brain nanobots might cause losing mind control and thus, the carriers can be controlled by others and lose their autonomy; they can be spied on permanently with the cerebral Internet and can lose their privacy; their memory can be deleted and they can lose their identity. Thus, the humans who carry technological implants can be permanently spied on, mentally controlled, and lose their identity, becoming human slaves at the service of Transnational companies and the economic powers. An objective analysis reveals that Transhumanism is only an intellectual swindle that leads to digital fascism, a society where a millionaire elite will govern citizens with technological implants, who will be digital slaves at the service of an oligarchy. Most amazing is that in spite of the unrealistic and almost delirious affirmations of Transhumanists, their theories are promoted and supported at the highest official level in the world and are promoted daily by the Press, and most remarkable is that they practically have no opposition from scientists or intellectuals, who even spread their unrealistic postulates. It is striking that Transhumanist postulates have been analyzed from different philosophical, sociological and religious points of view, as symbolized by Wikipedia’s summary on Transhumanism, however there is a surprising lack of questioning about the main high point of Transhumanist thought, and that by common sense, should be the first to interrogate Transhumanists on: the method by which they develop their risky and almost delirious Transhumanist projects and the adverse effects of their technological implants. In relation to the effect of technological implants on the human being, Transhumanists only promote brain nanobots as a benefit to society, Transhumanists do not inform people that the brain microchips and nanobots can be a weapon against the citizen; they would make us lose our mind control, citizens would be controlled by others and thus would lose their autonomy turning us into human robots; they would lose their privacy due to being permanently spied on with the cerebral Internet; they would lose their identity since their memory can be deleted with brain nanobots. Thus, if the citizens are spied, controlled mentally and do not have identity, they would become human slaves at the service of transnational companies and economic powers. Probably the best proof of the Transhumanist scam is that none of the Transhumanists use the dangerous brain implants and the technological innovations that they promote. In the massive public lectures they perform, they do not perform the “mind uploading” with the Brain Net, which allows a person’s entire private life to be made public. Regarding the method they are developing their Transhumanist projects with, almost like science fiction, such as fusing the human brain with that of a machine, this is a mystery. For that reason, for a person to be part of the almost amazing Transhumanist experiments like that of brain fusion so promoted by them, recent research provides evidence that transnational technology companies would be resorting to criminal methods: violence, swindle, extortion or organized crime. Obviously, these affirmations have no scientific support. Due to the high regulation that protects its citizens in rich countries, these dangerous experiments are probably carried out in poor countries such as those in Latin America. The transnational technology companies like Google transmit a message in their lectures that reveals an uncontrolled and dehumanized ambition towards technological innovation development in Latin America, probably due to the great economic power and the poor controls that they have. The almost amazing Transhumanist experiments like fusing the brain of a human to that of a machine, using bionic eyes, making changes in DNA, using implants in one’s own skeleton, all dangerous experiments that harm or put in danger the health of the experimentation subject, would be developing in Latin Americans at the expense of their health, honor, privacy and in some cases their lives. This suspicion is reinforced by recent researches alert to the existence of a global organized crime network to develop illicitly Transhumanist projects using nanotechnology in order to create human weapons, known as “nanomafias,” mainly in Latin America. For that purpose, citizens would be intoxicated with drinks and foods contaminated with Brain Nanobots or even would be kidnapped to install brain implants in them like the cortical modem or artificial hippocampus without their consent, using hospital surgeries mainly neurosurgery, and the victims who have suffered brain mapping whereby a robot has been constructed with their own brain algorithms would be beheaded to fuse their heads with those of robots created from their brain mapping. This (already existing) Mafia of transnational technology companies and corrupt governments involves administrators of hospitals, corrupt health unions, rectors, professors, librarians and university students, mafias of Police, prosecutor’s offices, judges, Intelligence services, and especially Press media and its extensive network of journalists who develop an insolent campaign to promote the use of technological implants. In a general view, the evidence points to the fact that the Transhumanist experimentation network is an interconnected global network, surprisingly organized by the billionaires of the world most promoted by the world Press, such as Carlos Slim, George Soros, Mark Zuckerberg, Larry Page, Sergey Brin, Bill Gates or Jeff Bezos. Bill Gates, through his foundation, funds projects of neurologists at the Sabogal Hospital in Peru that really develops neuroscientific projects that are camouflage for Transhumanist projects of mental control and cerebral Internet; Jeff Bezos, owner of Amazon Books finances a neuroscience institute in Princeton University, a university with close links in Latin America; Mark Zuckerberg, Carlos Slim, Larry Page, Sergey Brin, and George Soros are suspected of organizing the cerebral Internet in Latin America. Really, a global vision of Transhumanism reveals only a great swindle; Transhumanism does not seek to improve the individual as its promoters affirm but on the contrary, to turn the human being with technological implants into a slave at the service of Transnational companies and the economic powers. Transhumanists affirm that the human beings who use the technological implants and genetic engineering will be superior men and those who do not use them will be inferior men, according to Transhumanist symbology, the h + and the h-. For this reason, following their promotion, the rich with their great economic power will be able to buy technological implants and will be more superior and the poor without implants will be more inferior, thus, the social gaps will enlarge between the poor and the rich “the digital gap,” for that reason, the poor shall fight to also get “that advantage” and seek to get those technological implants. However, the truth is totally opposite. An elite of millionaires who will not use brain microchips and nanobots, and who will have access to the video stations to control mentally, spy and enslave the rest of the citizens. The rest of the society, the promoted “supermen,” “bionic men,” and the “h +,” will be human robots who will mandatorily use nanobots and cerebral microchips, devices that will be promoted as a compulsory requirement to get a job 9 in a very near future; really the h + will be the new slaves. In synthesis, reality is that h + will be the lower ones and the h – will be the superiors. The new slavery will be human robotisation promoted by Transhumanism, and the brain nanobots and chips will be the new chains and shackles. Transhumanism only seeks to achieve human slaves for the millionaires who rule the world. The fact of hiding the adverse effects of technological implants by Transhumanists, the non-use by Transhumanists of the brain implants that they promote, the billionaire promotion and financing of Transhumanism by the economic powers and transnationals of technology and the illicit human experimentation that is suspected to be the real secret method of these Transhumanist projects reveals that Transhumanism is a swindle, in order to lead us towards Digital Slavery and towards a fascist society where an elite will enslave digitally the rest of the citizens with technological implants.